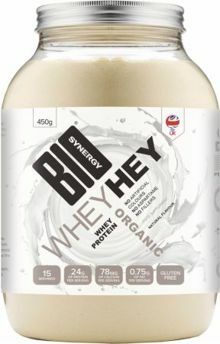 Bio-Synergy Organic Whey Hey is a delicious, light and refreshing organic natural flavoured whey protein powder. With 23 grams (80%) of protein, zero carbohydrates and over 5 grams of BCAAs per serving, this low-fat, organic & gluten free protein powder is ideal for adding to your favourite smoothie recipe or shake. Who is Whey Hey Suitable for? Whey Hey is a great, easy to consume form of protein. If you want a delicious tasting protein drink to help you recover after an intense workout, Whey Hey is the “whey” to go. This is sports supplement is gluten free, 100% natural and low in fat, so for those with gluten allergies and people who are calorie conscious, look no further than Whey Hey. For the best results, take two to three servings of Whey Hey per day: One in the morning, one after exercise, and one between meals. Mix with 200-300ml of water or milk. Shake well before consumption.